අද මම පෙන්නන්නම් Arduino Board එකේ pins 3ක් විතරක් පාවිච්චි කරලා devices 8ක් control කරන්නේ කියල.ඒකට අපිට ඕන වෙනවා shift register කියන IC වර්ගය. Q0 සිට Q7 කියන පින් 8 OUTPUT පින් විදිහට ක්‍රියා කරනවා. VCC කියන පින් එක සහ MR කියන පින් දෙකට +5V විභවයක් ලබා දෙන්න ඕනේ. GND කියන පින් එක ඍන විභවයක් ලබාදෙන්න ඕනේ. DS , ST_CP , SH_CP කියන පින් 3 Arduino board එකට connect කරන්න ඕනේ. මේ shift register එක ගැන සරල පැහැදිලි කිරීමක් සහ මේ shift register එක වැඩ කරන විදිහ මේ පහල තියෙන වීඩියෝ එකෙන් බලාගන්න පුළුවන්. හරි අපි දැන් බලමු කොහොමද shift register එකක් Home Automation Unit එකට connect කරගන්නේ කියල. ESP8622 module එකේ TX pin එක Arduino බෝඩ් එකේ pin 2ට connect කරන්න. ESP8622 module එකේ RX pin එක Arduino බෝඩ් එකේ pin 3ට connect කරන්න. DC to DC converter එකේ +VOUT පින් එක ESP8622 module එකේ CH_PD එකටත්connect කරන්න. DC to DC converter එකේ -VOUT පින් එක ESP8622 module එකේ GND එකට connect කරන්න. Display එකේ VCC පින් එක dc to dc Converter එකේ +VOUT පින් එකට connect කරන්න. Display එකේ GND පින් එක dc to dc Converter -VOUT පින් එකට connect කරන්න. Display එකේ SCL පින් එක Arduino එකේ A5 පින් එකට connect කරන්න. Display එකේ SDA පින් එක Arduino එකේ A4 පින් එකට connect කරන්න. Shift Register එකේ DS(14) පින් එක Arduino බෝඩ් එකේ pin 4ට connect කරන්න. 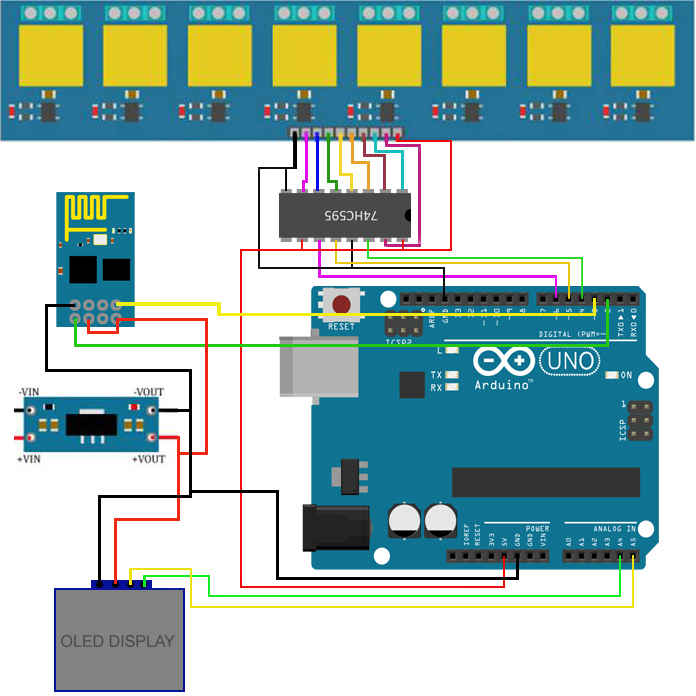 Shift Register එකේ OE(13) පින් එක Arduino බෝඩ් එකේ GND එකට connect කරන්න. 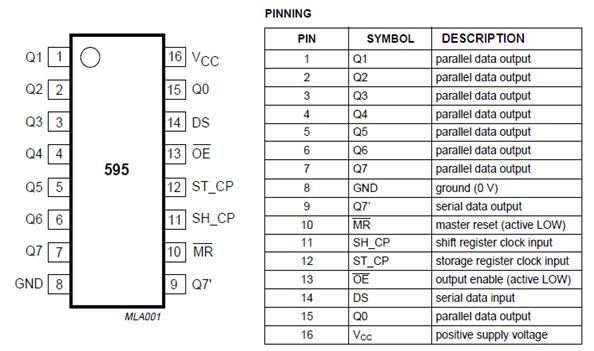 Shift Register එකේ ST_CP(12) පින් එක Arduino බෝඩ් එකේ pin 5ට connect කරන්න. Shift Register එකේ SH_CP(11) පින් එක Arduino බෝඩ් එකේ pin 6ට connect කරන්න. Shift Register එකේ MR(10) පින් එක Arduino බෝඩ් එකේ 5V පින් එකට connect කරන්න. Relay module එකේ GND pin එක Arduino බෝඩ් එකේ GND pin එකට connect කරන්න. Relay module එකේ VCC pin එක Arduino බෝඩ් එකේ 5V pin එකට connect කරන්න. Relay module එකේ IN1 pin එක Shift Register එකේ Q0 pin(15) එකට connect කරන්න. Relay module එකේ IN2 pin එක Shift Register එකේ Q1 pin(1) එකට connect කරන්න. Relay module එකේ IN3 pin එක Shift Register එකේ Q2 pin(2) එකට connect කරන්න. Relay module එකේ IN4 pin එක Shift Register එකේ Q3 pin(3) එකට connect කරන්න. Relay module එකේ IN5 pin එක Shift Register එකේ Q4 pin(4) එකට connect කරන්න. Relay module එකේ IN6 pin එක Shift Register එකේ Q5 pin(5) එකට connect කරන්න. Relay module එකේ IN7 pin එක Shift Register එකේ Q6 pin(6) එකට connect කරන්න. Relay module එකේ IN8 pin එක Shift Register එකේ Q7 pin(7) එකට connect කරන්න. DC to DC converter එකේ +VIN පින් එකට වෙනම 5V power source එකකින් ධන අග්‍රයක් සම්බන්ධ කරන්න. DC to DC converter එකේ -VIN පින් එකට වෙනම 5V power source එකකින් ඍන අග්‍රයක් සම්බන්ධ කරන්න. 5V power source එකේ ඍන අග්‍රය Arduino බෝඩ් එකේ GND එකට connect කරන්න. ඊට පස්සේ කරන්න තියෙන්නේ Introduction Page එකට ගිහිල්ල තියෙන updated ලින්ක් එක හරහා updated Speech Recognition System එක download කරගෙන install කරගන්න , ඊට පස්සේ Home Automation - 04 පොස්ට් එකේ තියෙන විදිහට settings හදාගන්න.